Another school year has just begun! That means it’s time to start driving your child to school again, attending parent-teacher conferences, going to school plays, packing PB & J in your child’s lunch box, and taking your child to soccer practice. But that’s not all that it means! With the start of a new school year, your child is advancing another grade level and, you know, their classes are going to become more demanding and difficult. 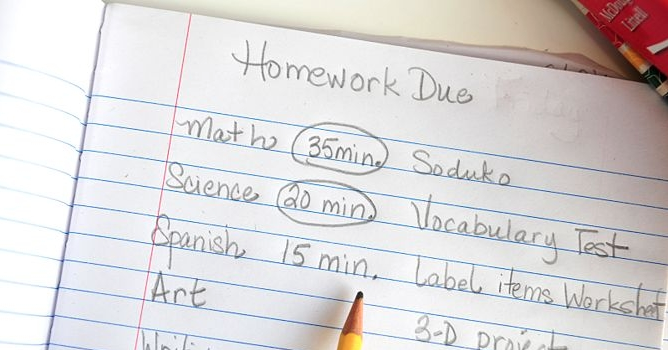 When children take on larger workloads, it’s not uncommon for their grades to begin declining and for them to become stressed—time management is a tricky thing to learn! So don’t worry if your child starts having trouble coping with the more intense workload. There are tons of lovely tutors who can help your child get back on track! Does my child need a tutor? How can I know? Well, there are a few signs that might indicate that your child needs a tutor. I’ve gone ahead and outlined the 6 most common. If your child is exhibiting any combination of these signs, you should definitely look into tutoring. Really, you should probably do it before report cards go out—nothing’s more discouraging than your first F! 1. Their grades are beginning to slip. You probably guessed that this one would be on the list, am I right? Have you noticed a gradual or sudden decline in your child’s grades? They used to do so well on spelling tests! Why, all of a sudden, are they getting Cs on every test?! A decline in grades can be due to a number of factors. Try making an appointment with your child’s teacher. He or she likely keeps copies of some of your child’s assignments and tests, and would probably be more than happy to go through them with you so that you can pinpoint any particular areas in which your child might be struggling. Maybe your child has difficulty memorizing their multiplication tables, or maybe the issue is reading comprehension! If your child isn’t struggling with any particular school subject, perhaps your child’s teacher has noticed a change in their behavior. Perhaps your child simply isn’t paying attention in class anymore. 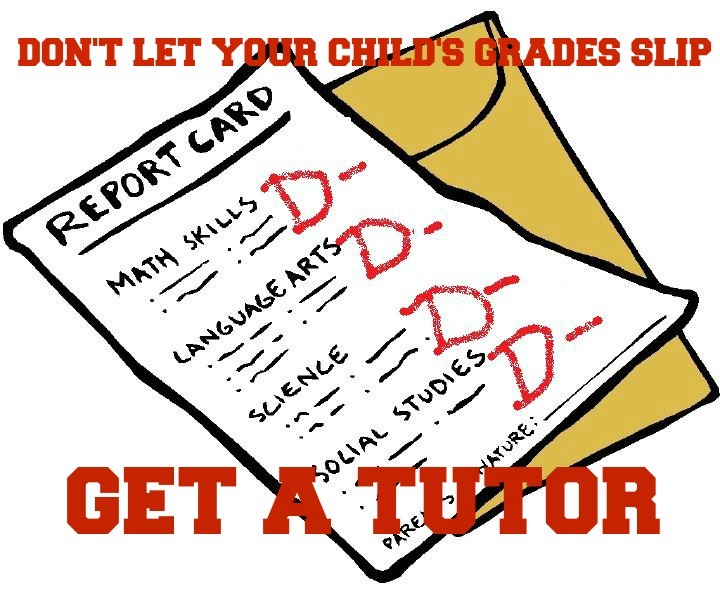 Whatever the reason for their declining grades, it’s important that you get your child a tutor as soon as you notice it, so that your child can get back on track before report cards go out. 2. Your child is not effectively managing their time. What has your child been doing with their time lately? Is your child involved in any extracurricular activities? Theater? Soccer? Underwater basket weaving? Basically, if your child is involved in some sort of demanding extracurricular activity, you should probably have a conversation with them about time management. As children get older, and involve themselves in more organizations and clubs, it becomes harder for them to manage their time. You might find that your child sometimes doesn’t even leave school until 5pm. Add about 2 hours to account for the drive home and dinner, and your child only has 3 hours to complete all of their schoolwork before going to bed! Time management is extremely difficult, but it’s an important skill to have in life, and if your child cannot effectively manage their time, odds are it’s going to take a toll on their grades. Tutors are great for teaching children time management, because they put children on consistent homework schedules, and help them learn how to complete their work accurately and efficiently. 3. Your child is constantly stressed. This one kind of goes along with the previous tip. Sometimes being involved in too many things (clubs, sports, school, etc.) can suffocate your child, and make them feel like they have no time for themselves. Stress can lead to a lack of motivation, and ultimately take a toll on a child’s academic life. But rather than ask your child to quit their extracurriculars to free up their schedule, you should help them study more effectively in what little free time they have. Tutors are notorious for being able to help children understand concepts quickly. Get your child a tutor and not only will their grades improve, but they will also get their schoolwork done faster, giving them more free-time and eliminating stress! 4. 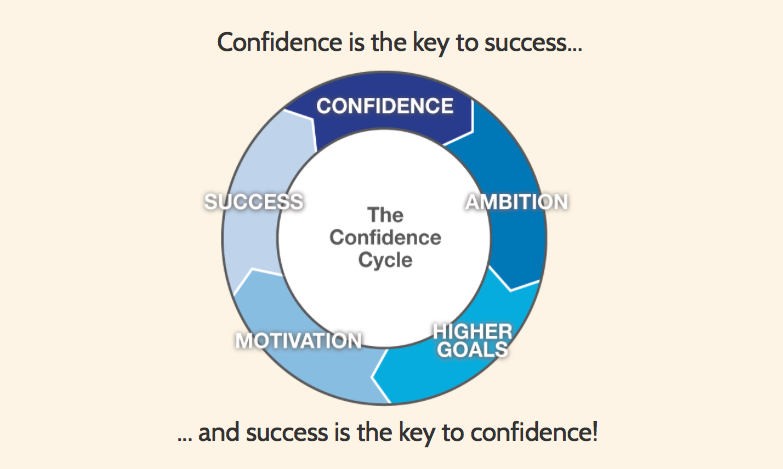 Your child lacks confidence. We’ve all been there… We complete a math problem and feel so confident and proud of our final answer, only to find out we’ve made some silly mathematical error! Even just having this happen once can be discouraging…but if this happens to your child regularly you might have an even bigger problem on your hands. When kids try hard in school and get bad grades, they get frustrated, lose confidence in themselves and stop trying altogether. When this happens, your constant nagging at them to do their homework is only going to make things worse. At this point, it’s best to bring in a tutor. Make sure the tutor gets at the root of the problem—why does your child still do poorly even when they try their hardest? The tutor will figure out what sorts of mistakes your child is continually making, and work with them to make sure they won’t make those same mistakes in the future. Once your child starts doing well in school again, they’ll be motivated to start trying again, and your little Sally or Joey will be back to his or her old self! 5. Your child has a negative attitude about school. Let’s face it—no child LOVES school. But for the most part, school isn’t so bad, right? Kids get recess, they get to see their friends, and many teachers make learning fun. So when your child starts trash-talking school and saying things like “school’s dumb,” or “why do I even have to go to school?” you might want to take a look at their grades. There may be some sort of connection between their low grades and their attitude about school. For some kids, it’s pretty simple—they aren’t doing well in school, so naturally they don’t like school, but for some kids it’s a bit more complicated. Does your child ever fake sick to get out of school? Do they not have friends over very often? Maybe your child isn’t getting along with their classmates. Perhaps they’re shy and have trouble making new friends. Maybe your child is a victim of bullying. Whatever the source of your child’s negative attitude toward school, a good combination of tutoring and counseling can help get your child’s academic and social life back on track. 6. Your child shows signs of a learning disability. Oftentimes, when a child is struggling in school, they may have some sort of learning disability. 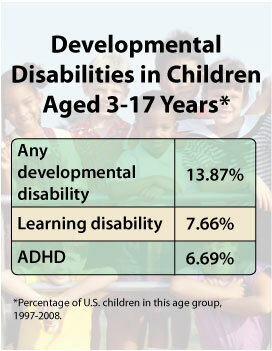 Common learning disabilities amongst children include dyslexia and ADHD. There are numerous forms of treatment for these disorders, but the hard part is figuring out whether your child is simply struggling in school, or has a learning disability. Does that list describe your child? Make an appointment with a doctor, or a child psychologist for proper treatment. In the meantime, you should hire a tutor. Tutors have a great deal of experience working with children who have learning disabilities, and often the best thing for a child with a learning disability is one-on-one instruction. Most kids struggle with school at some point in their life, and if your child’s in a slump, they’ll move past it in no time. With the help of a tutor, your child will be on the path to success once more! It is good to know that a tutor would be beneficial for your child if your child is constantly stressed. Realizing that being involved in too many extra curricular activities can be straining is important. It would be great to get help from a tutor so that homework gets done in a reasonable amount of time allowing your child to be more involved in other activities. Recently my friend’s daughter has been having a hard time in school and her grades are dropping. You mentioned that whatever the reason for their declining grades, it’s important that you get your child a tutor as soon as your notice it so that your child can get back on track before report cards go out. Do tutors specialize in different subjects? It may be beneficial for them to hire a tutor.